As this year's Minnesota Varsity Showcase Concert approaches (April 30), Classical MPR is proud to mark our fifth year of collaboration with American Composers Forum to spotlight top high-school-age classical performers and composers, on the air and in concert. One of the rewards of bringing these talented young musicians together via Minnesota Varsity is that some are now collaborating with each other to create and perform new works! At a February Bloomington Symphony Orchestra concert, 2011-2012 Minnesota Varsity flutist Karen Baumgartner performed the premiere of 2013 Varsity composer Grant Luhmann's Flute Concerto with Manny Laureano conducting. 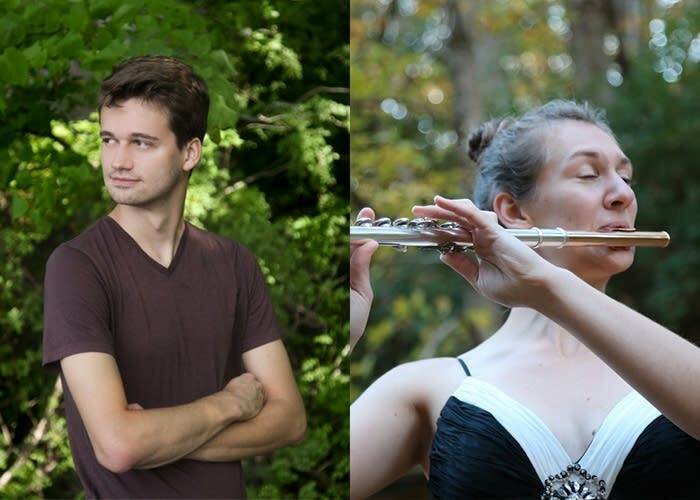 Grant and Karen, former Minnesota Youth Symphonies members under Laureano while in high school, collaborated on the Flute Concerto as Indiana University students — he, majoring in Composition and she, a Flute Performance major. Listen to the premiere of Grant Luhmann's Flute Concerto via the link at the top of the page, and read each of their accounts of how the piece came to be written below. They have since presented Grant's arrangement of the concerto for chamber ensemble, as part of his senior recital. And for more evidence of classical music's bright future, join us at the Fitzgerald Theater on Sunday, April 30 at 5 p.m. for stunning performances by more of our region's gifted young musicians! Admission to the Minnesota Varsity Showcase Concert is free, but reservations are required — call the Fitzgerald Box Office at 651-290-1200 or reserve your ticket online. The process for premiering Grant Luhmann's Flute Concerto started back in 2013 when I was a sophomore at Indiana University. The dean of the music school, Gwyn Richards, was talking to a group of us about collaboration and specifically mentioned instrumentalists and composers working together. I immediately fell in love with the idea of premiering a piece and started thinking about what composers I could collaborate with. Not too long after this I ran into Grant Luhmann who I already knew from playing in Minnesota Youth Symphonies. He was just starting his composition degree at IU and I briefly mentioned the idea to see if he would be interested. At this point I was thinking about doing a small piece for flute and piano on a recital. Grant agreed so we started chatting about the piece when we would see each other in the hallway. After a bit of brainstorming and running into each other, the project went from being a piece for flute and piano to being a piece for flute and string quartet. At this point I began thinking about how fun it would be to premiere a flute concerto with an orchestra. I was excited to mention this idea to Grant but in all honestly was expecting him to say that it would take too much time and effort to write. To my pleasant surprise Grant considered the idea and said he would be willing to write a concerto for me. I do not think either of us realized what we were getting into at this point but I was already having fun. Grant said that in order to make it worth his time and effort I would need to find an orchestra to premiere the piece before he could start writing such a large work. I had no idea how I was going to find an orchestra to premiere a flute concerto but was too excited to be deterred. Since Grant and I are both from Minnesota I started sending emails to orchestras, colleges, and teachers throughout Minnesota. Unfortunately, I was not having much luck. Understandably, most orchestras did not want to commit to premiering a work that two students were putting together before having any idea what the piece would sound like or the work that would be required to put it together. One of the people I made sure to contact during this time was Manny Laureano. Grant and I both enjoyed working with Manny in MYS and hoped that he would consider premiering this piece with the Bloomington Symphony Orchestra. After some consideration and a bit of back and forth Manny agreed to give the piece a go. At this point two years had gone by since I first had the idea of premiering a piece. To say I was excited to hear that Manny would program the piece is an understatement. I was also thrilled to finally be able to tell Grant that he could start writing the concerto. I quickly became amazed at Grant's talent and the exceptional care he takes in writing a piece. I realized how incredibly lucky I was to be premiering a piece by him. Grant asked a lot of questions about what pieces I like to play and what sorts of things I love doing on the flute. He started doing a lot of research on flute pieces and techniques and delved deeply into the compositional world that I do not even pretend to understand. During this process I graduated from Indiana University so our hallway chats turned into texts, emails, and skype sessions. Grant would send me techniques and elements he was thinking of incorporating and I would try them out. I continued to play sections for Grant over Skype or would send him recordings as the piece morphed into the final product. It was thrilling to be experimenting with elements I had not done much with before, which included sweeping harmonics as well as harmonic trills and tremelos. Grant also made sure to throw in a good dose of fast technical passages as I have always thrived on those. In the end this whole project turned out to be a completely incredible and eye opening experience. Grant wrote a killer flute concerto and getting to perform it with Manny at the helm is one of the best experiences I have ever had. I am so fortunate to have been able to collaborate with such brilliant musicians. Since the orchestral premiere Grant arranged a chamber version of the piece which I was able to perform on his composition recital. We have both planned for this piece to have a long performance life and are excited for the added opportunities this chamber version will create. In the meantime we already are working on some potential future performances of both versions and will continue to look for opportunities to share this piece with more audiences. Writing for a powerhouse performer like Karen Baumgartner is like being given keys to a Ferrari for a day. You could do a couple things with it: Are you going to mosey on suburban streets, maybe practice your parallel parking? Or are you going to take it out to the freeway and go really, really fast? Predictably, I chose the latter option. I wanted to write a piece that would both play to Karen's strengths and give her something new to work on. The first word that springs to mind listening to her play is "technique"--she's capable of playing absurdly fast passages unerringly and with apparent ease. Yet her lyrical abilities are just as formidable: I was deeply inspired by a Bach performance she gave on her senior recital in which she managed to give the illusion that she was a choir of flutes instead of a single performer, each embedded voice brought out to create harmony. Her rich, strong low register was another inspiration, and I resolved to make full use of it. Working in close collaboration proved absolutely crucial to the life of the piece. I regularly sent fragments to Karen, and she gave feedback on what was comfortable, what was challenging, and what needed rethinking. We ended up with a piece that plays to a lot of Karen's strengths, but also pushes her in new ways. There are even stretches that rely on techniques that, before this collaboration, neither of us knew flute could do. The most important non-standard technique is a sort of overblown trill effect, but taken to the "nth" power. By overblowing and manipulating her embouchure a specific way, Karen could create sweeps of sound up and down the harmonic series. It's a similar principal as how blowing a bit harder on recorder makes the pitch jump an octave, or how lightly touching a violin at certain points can elicit a tone along the overtone series. But this was just the beginning; we tried adding tremolos and trills on top of this, then different speeds of overtone sweeping. The result was fascinating: sheets of shimmering sound unfold over the pitch spectrum with a remarkably electronic-sounding aura. This became a core technique for the piece. Another technique based on overblown harmonics involved notating her fingers and embouchure separately; I wrote a part for her fingers to play, like guitar tab, underneath a line with specific harmonics that I wanted her to pluck out over those fingerings. The technique elicits an airy, ghostly tone, and you can even see her fingers move in a different rhythm than the melody you hear coming from the instrument. There are a few challenges I was aware of beginning this project. One difficulty with any concerto is the issue of balance: With sixty musicians pitted against one soloist, the orchestra can easily overpower and bury the principal part. I wanted Karen to feel like she could play completely comfortably, phrase as expressively as she liked, and never have to force her sound just to be heard. I was also conscious that the classic "young composer" mistake would be to orchestrate overzealously and wipe out the solo part by burying her under thick textures. Months of studying concerto repertoire showed me how composers have made this work in the past. The other challenge was finding orchestral colors that fit the same sound-world as the highly complex flute part while keeping the ensemble score as playable as possible. After deciding on the type of language I was using in Karen's solo part, I knew I would need something equally evocative for the orchestra. Many of her harmonic-based and overblowing effects leave a sort of electronic or digital impression and produce a lot of high, noisy overtones. Could the orchestra perhaps do something similar? Emulating these non-pitch based effects was a real orchestration brainteaser. For instance, I couldn't create a call-and-response passage merely by giving fragments of Karen's music to the trumpets or strings, as she plays a wealth of effects that work only on flute. Instead, I tried to synthesize her sound using ensemble combinations. For instance, an overblown sweep with a trill could be emulated by having strings "flutter" on harmonics of their own (creating a similar tone quality) while trumpets make a fast "wah-wah" with a harmon mute (emulating the trill effect) and vibraphone rolls hold out her written pitches, linking the parts by harmony content. All playing together, these instruments create a distinctly orchestral version of her music despite the fact that nobody plays a part that looks anything like hers. The resulting orchestration is therefore very complementary rather than ensemble-versus-solo. The orchestra is like a guitar effects pedal that electronically modifies and interacts with Karen's sound. It's also convenient that many of the orchestral effects — things like fluttered string harmonics, muted brass, and harp and vibraphone solos — tend to be very soft, allowing Karen to be heard at all times. Having Manny Laureano conduct the group was the last puzzle piece we needed to bring the whole concerto together. Despite my best intentions about playability, the orchestral score looks very intimidating. But Manny made the difficult score approachable for everyone, and helped especially in teaching the group to treat their sound as an extension of Karen's. Both Karen and I were thrilled by the outcome of the premiere and are hopeful for more performances in the future. I'm excited to see where it goes next!